Durga, all fearlessness, patience, full of humor and creative feminine force, rides her tiger onto the field of battle, her eighteen arms holding weapons, the gifts of Hindu gods. Fiercely compassionate, astride her tiger, the warrior goddess engages in epic spiritual battles to protect virtue and subdue the evil chaos unleashed upon the world by demons. Durga rides a tiger because it is a symbol of unlimited power; the tiger is the king of the forest, a power on earth beyond the reach of any mortal. An important figure in Hindu mythology, today the tiger is the national animal of India. 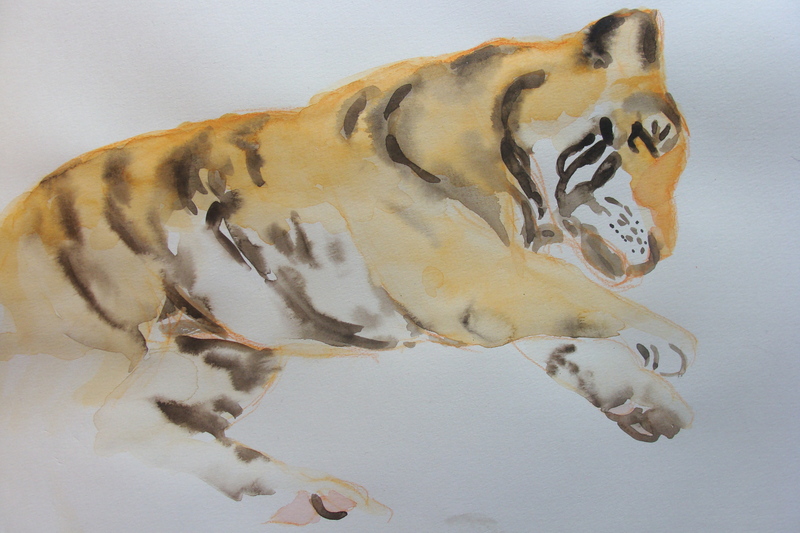 Inspired by Tea Obreht’s talk at Bookshop Santa Cruz about her magical story The Tiger’s Wife, I went to the Oakland Zoo to paint the tiger. Obreht’s book examines how myths and stories can be a force for good or fuel for fear running “like secret rivers through all the other stories of a life.” Obreht engages animal symbols to examine our fears about people – their race, culture and religion. For Obreht animals in our myths and stories are symbolic catalysts for choice as we navigate life. Is that animal an “it” or a “thou”? The answer will determine how you act. You have a choice. And by extension is the stranger an “it,” or perhaps someone with relationships, hopes and dreams just like you? Pondering human nature in terms of communication taking the form of a monologue or a dialogue, the Jewish philosopher Martin Buber described human existence in categories of consciousness, interaction and being in his book I and Thou. Myths and stories can be a force for good. Durga and her tiger subdueing evil chaos on a daily basis is a story that strengthens me while navigating a chaotic and unjust world. But Obreht weaves a different story. In her tale, the outsider – a person from a different culture and religion – through circumstance, becomes the Tiger’s wife, a person, perceived by villagers afraid of “the other,” as a powerful mythical devil hell bent on bringing destruction. Obreht’s grandather tells Natalia “there are some stories you keep to yourself – it belongs only to you.” But Obreht’s tale is not a story you keep to yourself, it is one share. After reading The Tiger’s Wife, I found myself acting out the pilgrimage of Natalia and her grandfather seeking Shere Kahn, immortal tiger of The Jungle Book. Last Fall, the Oakland Zoo rescued four young tigers, sisters all: Ginger, Grace, Milou, and Molly. Privately owned, a divorce suddenly rendered the young tigers homeless. The Oakland Zoo gave these magnificent and powerful animals a home, respecting the need to keep them as a family. While there are only 3,500 wild tigers worldwide, it’s estimated there are more than 8,000 tigers privately owned in the U.S. and only a few of those are found in zoos. Tigers once ranged across Asia from Turkey to the eastern coast of Russia, as well as Java and Bali. Today they are an endangered species having lost 93% of their historic range and their dwindling numbers in the wild are now found only in India, Nepal, Russia, China and Southern Asia. If tigers are to survive in the wild and in captivity, we must see them as beings worthy of our respect; they must be “thou” and not “it.” As Obreht writes “he was only half wild and in his partial tameness…..he missed…..the companionship and predictability of life at the <zoo>…..however expertly he learned to fend for himself, his life as a tiger had been tainted since birth – maybe that great Shere Kahn light my grandfather believed in had already been extinguished….. but that is not the tiger on whose account my grandfather carried The Jungle Book in his pocket every day for the rest of his life….. it was <the Tiger’s Wife’s> great fortune…..to encounter a tiger that was not all tiger…..maybe it’s enough to say he enjoyed the sensation of her hand between his eyes…..she liked the way his flank smelled when she curled up against him to sleep.” Animals in our myths and stories are symbolic catalysts for choice as we navigate life. And in reality, how we choose to honor the lives of animals, reveals much about how we choose to honor life itself.